Comoé Capital’s first investment as part of the Education Impact Fund (an initiative supported by the Jacobs Foundation), Vallesse is an Ivoirian publishing house founded in 2005 by Fidèle Diomandé, an entrepreneur committed to youth education in Côte d'Ivoire. VALLESSE's editorial collection consists of four collections and some thirty works in the fields of general, school and children's literature. Before founding VALLESSE, Fidèle Diomandé already had several years of experience in the publishing sector. She started her career in 1999 at CEDA (Centre d'Édition et de Diffusion Africaine), the first publishing house in Côte d'Ivoire. Fidèle quickly felt the need to create her own publishing house in order to offer better quality books with an emphasis on young people and decided to launch the publishing house Vallesse Editions. 1/ What were the mains reasons that drove you to found the publishing house VALLESSE? I discovered the editing sector almost by accident: after obtaining a degree in economics, I did an internship in one of the first publishing houses in Côte d'Ivoire. I pursued my career in the publishing sector, with professional experiences both in Abidjan and in Paris and I completed my studies at the CAFED (African Publishing and Diffusion Training Center). In 2005 I decided to launch my own publishing house. With several friends we capitalized our know-how and assets, convinced that we could contribute to the production of quality books in Côte d’Ivoire. Our objective was also to improve the educational system in our country by offering literary works that take into account the environment and daily experience of the youth. 2/ How did you meet Comoé Capital ? What is the purpose of this partnership? 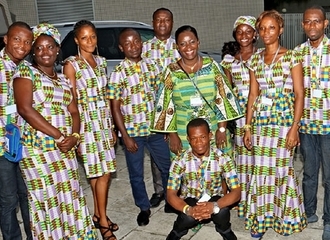 Comoé Capital follows very closely the education and publishing sectors in Côte d’Ivoire, and it was easy for them to contact Vallesse Editions. We enthusiastically welcomed the partnership, which began with an initial due diligence phase and an audit of Vallesse Editions. This preliminary work enabled us to better understand the book market in Côte d'Ivoire and its players, to appreciate Vallesse Editions' positioning and to assess the solidity of our internal organization. Comoé Capital's presence with Vallesse Editions is therefore structured around three axes: financial support, technical assistance and networking. Comoé Capital provides the necessary resources to finance the production of our publications and assists us in the management of the company thanks to a monthly strategic committee. Comoé Capital also brings technical assistance resources, which are used to train the staff (especially in sales, accounting and marketing) and to implement management tools. Finally we benefit from Comoé Capital’s network, thanks to which we were for example able to obtain the support of the French Institute to organize activities with our authors. 3/ How does VALLESSE contribute to Côte d'Ivoire's development, particularly on education issues? Any publisher is first and foremost an educational and a development actor. Vallesse Editions is particularly careful to promote books that are relevant and useful to the youth. For example we dealt with the issue of the reintegration of child soldiers with a work by François d'Assise N'Dah entitled "The Return of the Child Soldier". We also addressed the problem of illegal immigration through Josue Guébo's novel “Destins de Clandestins”. We also have books that deal with the issues of pregnancy (“Douleur Intime” of Fatou Diomandé) and HIV-AIDS prevention (Jours d’angoisse of KONÉ Joël). All these books contribute to raising young people's awareness of issues that affect them. 4/ What are VALLESSE's short- and medium-term projects? Our main objective is to complete the collection “Cahier de la Réussite”, which must eventually take into account all secondary levels as well as all disciplines. In parallel we are extending our collections of general literature, including a section dedicated to children literature. In the medium term we also plan to launch two new collections, thriller and personal development. Finally we would like to find partners who will help us relaunch “Les Manuscrits d'Or”, a literary competition for young people in secondary and primary schools. The purpose of this competition is to foster a culture of openness, to help build a national memory and to identify new literary talents.